I have been lagging behind on my reading (offline stuff) so I thought I'd talk about a really unique science fiction novel I read last year. 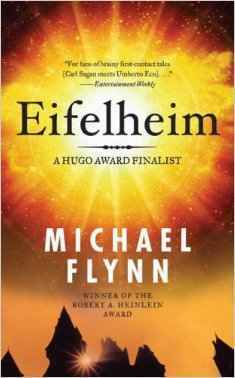 Eifelheim is about a first encounter with aliens in medieval Germany at the time of the Black Plague. The story starts out in the modern day, where a historian is trying to figure out why a certain area near the Black Forest, which was once a prosperous village, was abandoned in the middle ages and never resettled, despite it's fertile and well-sited location. The story then switches to that village back in the 1400's, focusing on the village priest, Father Dietrich, an educated and open-minded man of natural science. Something happens that day - an unusual vessel with strange, inhuman passengers arrives in the forest. Are they demons? Are they simply pilgrims from very far away? The book goes back and forth between modern day and medieval. The medieval story is really where all the action is. It is really well-done historically - not only are the details well-researched, but the writer is really able to show how differently the people of the middle ages thought, how they perceived the world, what was important to them. They are almost as alien to us as the aliens they encounter. The modern day story is not as interesting as the medieval one, as it is mainly about the historian and his physicist girlfriend, who are not very likable. They are mainly there to explain to the reader the scientific theory behind what happened in that village long ago. I found this a fascinating, though long, read. One of the most interesting things to me, in the story, is how the medieval villagers whole lives revolve around their Christian faith, and how that informs how they deal with their visitors. It sounds interesting. I hope he does well with it. But I'll have to wait until he gets the rights back and publishes it elsewhere as I refuse to give any of my money to a company (or the people running it anyway) that abhors by existence. You mean Tor? Eifelheim did ok I guess, not a bestseller, but you could borrow it from the library if you are interested. It's a big thick book.